The Japanese have to show that they can take anything America does and do it better. They've finally turned their attention toward the excess which is "dessert pizza". Given the enormous task involved in taking something as sacred as putting sugary delights on pizza dough, Pizza Hut decided to combine its research forces with that at Morinaga, a company known well for it's caramel delights. 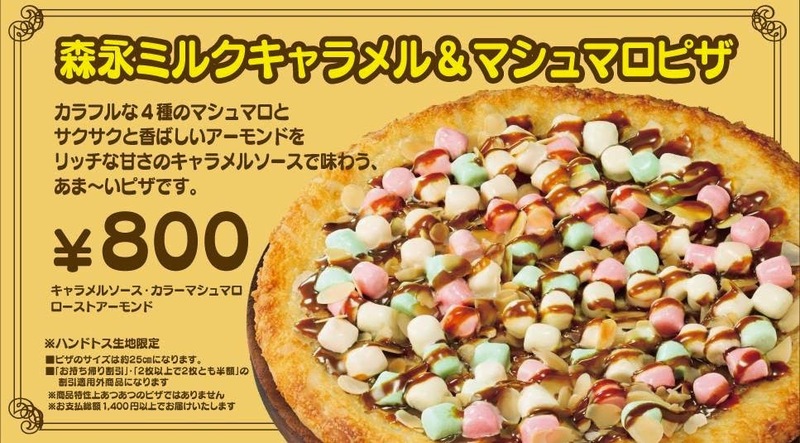 As you can see by the ad, the pizza costs 800 yen (about $8) and is topped with "colorful marshmallows", almonds, and caramel sauce. It is 25 cm. (about 10 in.) in size. This monstrosity became available on June 10 and will be making new cavities for a limited time. You can have it delivered to you, but only if you buy at least 1400 yen worth of food at the same time. I think I have seen something similar in America. It was something akin to a triple decked fudge brownie on a cookie crust. Just looking at it makes me teeth hurt!